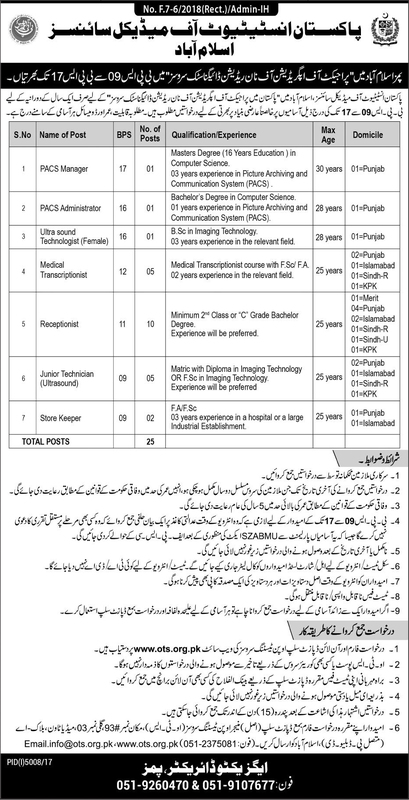 Daily Jang Newspaper 18th March 2018 has announced 25 New Jobs for Pakistan Institute of Medical Sciences (PIMS) Published on 18-03-2018. These recruitments are for Project of Up gradation of Non Radiation Diagnostic Services in PIMS. Interested Candidates can apply for Jobs in PIMS Islamabad 2018 against the title of PACS Manager, PACS Administrator, Ultra Sound Technologist, Medical Transcriptionist, Receptionist, Junior Technician Ultrasound and Store Keeper. Candidates are directed to Visit Open Testing Service Website to apply online for these Jobs. Pakistan Institute of Medical Sciences (PIMS) 25 Jobs Daily Jang Newspaper 18 March 2018.